There is nothing better than a roasted chicken dinner on a Sunday night with my family. I have been making this chicken for so long I could make it in my sleep. 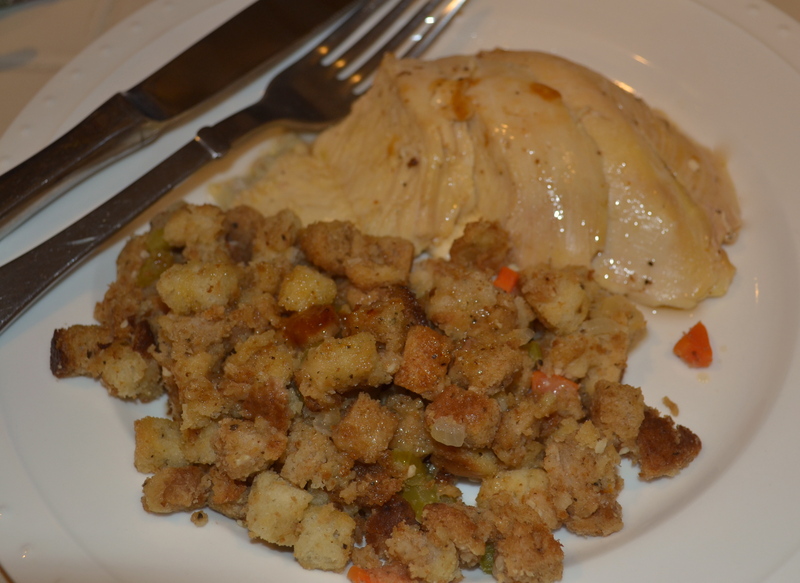 Easy, delicious and comforting….some of my favorite things. This week has been super busy and I am going out of town on business for 3 days so I have zero time for fancy or intricate dinners tonight. 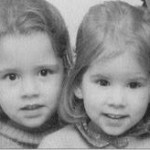 Boys are playing in their rooms, hubby is hunkered down somewhere on the property doing hubby type things and I am packing/doing laundry/prepping the kids lunches/feeding pets/writing instructions to be posted on the fridge/etc… you get the picture. 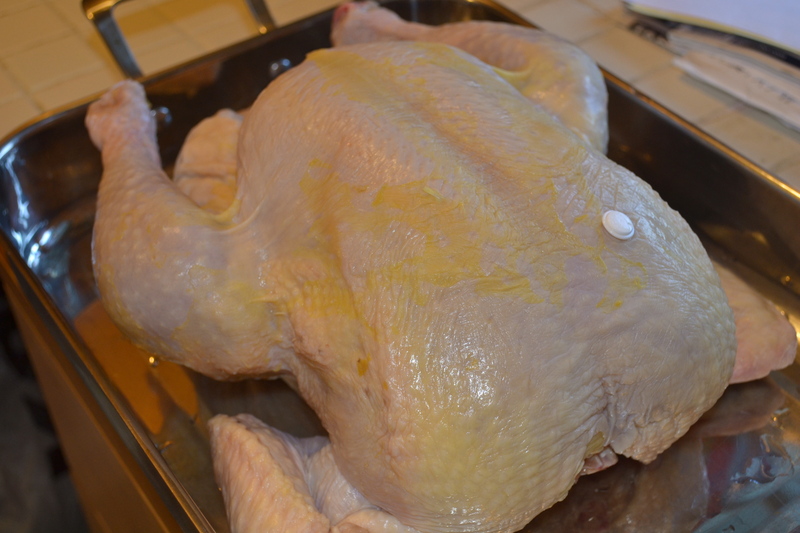 Start with a good quality bird, rinse well, pat dry, place in roasting pan. Preheat your oven to 350 degrees. 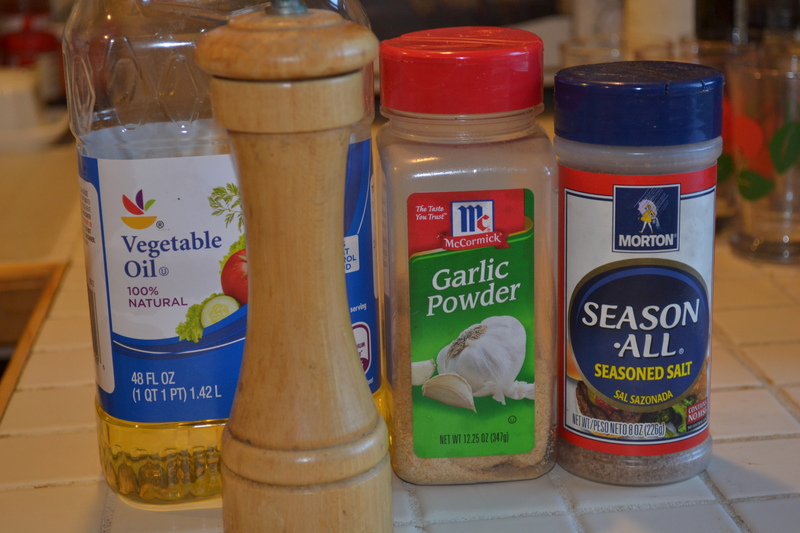 I drizzle vegetable oil, or olive oil, on the chicken, rub it all around and then liberally sprinkle with garlic powder and seasoned salt & pepper. Use whatever seasonings you like. 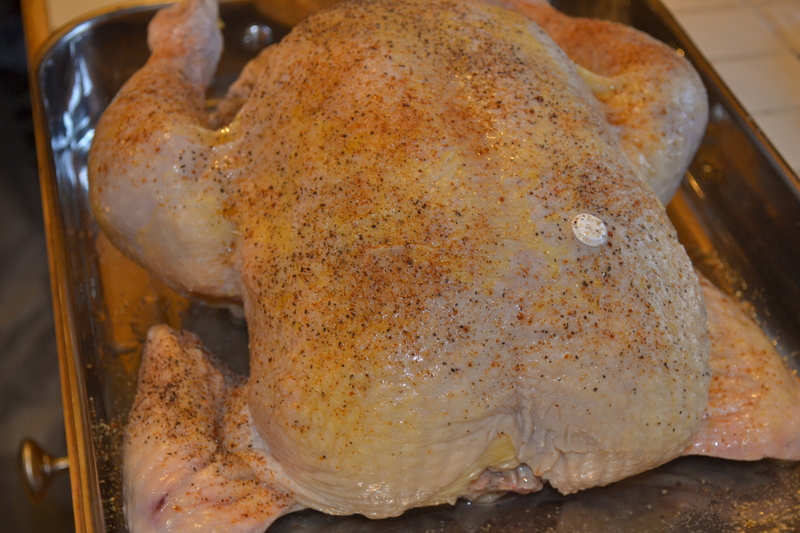 The chicken is covered with seasoning, the oven is hot, and in she goes. 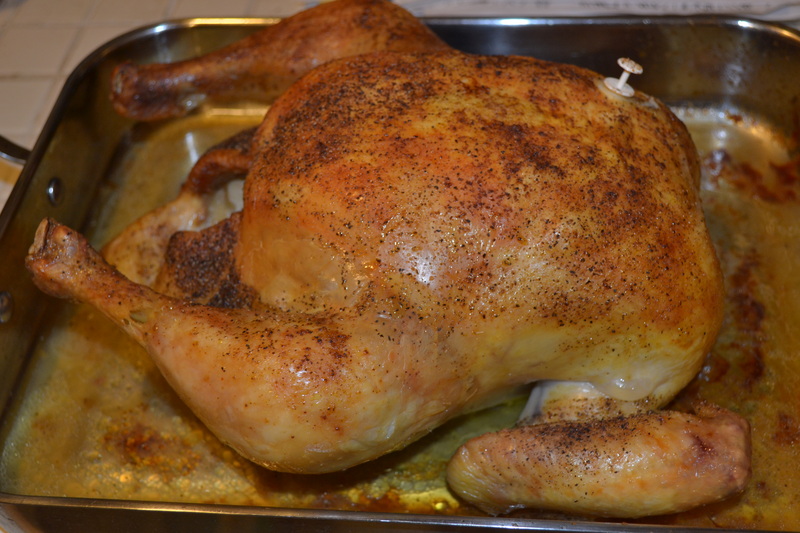 I roast my chicken until the timer in the bird pops up (about 1 – 1.5 hours) but in case your bird does not have a timer make sure the internal temperature of your bird is 165 degrees and the juices are running clear. The last thing you want to serve your family is an undercooked chicken. Your cooking time will also depend on the size of the chicken. I use perdue oven stuffer roasters. While the chicken is roasting I prep the vegetables for the stuffing. I chopped up onion, celery and carrots. I was making about a 1/2 bag of stuffing so I only chopped about 3/4 cup of each vegetable. 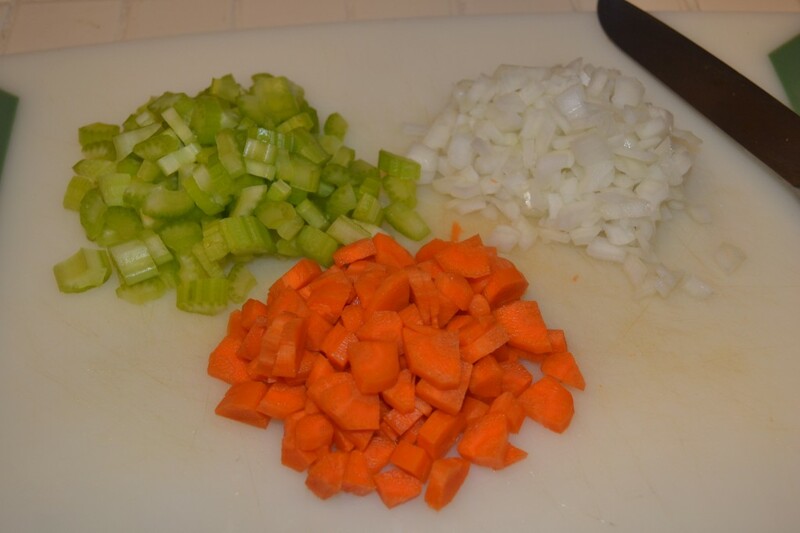 Put your diced vegetables, with a tablespoon of olive oil, into a hot pan (medium heat). Stir to keep the vegetables moving so they don’t burn. You want them to soften and turn opaque. 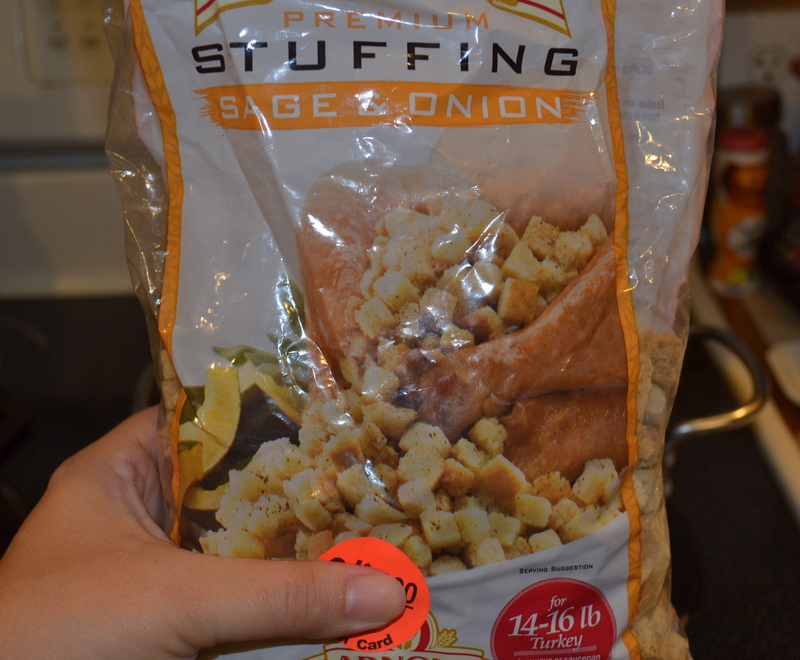 Tonight I used the onion/sage flavored stuffing. I most often use plain but this needed to be used up. Basically once your vegetables are soft you want to follow the directions on the bag of stuffing. Heat water and butter to boiling, add in the measured amount of dried stuffing cubes, take off the heat, stir. Just remember to add in the veg. that you have cooked. They add a wonderful layer of flavor. When the chicken is finished you will end up with a crispy skin, juicy interior and heavenly taste. The kitchen smells amazing and I think I just equate fall & winter Sundays with the smell of roasting chicken. Yum! Remove the chicken from the roasting pan to a carving board and let it rest for about 10 minutes while you prep your plates and utensils, or have the kids come and set the table. 🙂 Carve up your bird and plate with the stuffing, add a side salad or perhaps some green peas and you have a delicious & easy sunday night dinner. I hope everyone has a great week. Here’s to Sunday dinners together and football in the afternoon (GO BRONCOS! ).